Uninspired by the state of mobile gaming on Android? Doesn’t have to be that way - Enter the Moga Pro controller. Gaming on Android is dominated by puzzle and endless runner games that you can play for a few minutes to kill time. Save for a few great games like VVVVVV gaming on a touch screen is in a totally different leagure to the tactile experience of PC or console gaming. The new higher end Moga controllers bring the great tactile experience of console gaming to mobile. Think PSX/Xbox controller for your phone or tablet that ‘just works’ and is actually enjoyable to use. Whiles the MOGA controllers are pitched for modern Android games, the MOGA shines when used with emulators (GameBoy, PlayStation, SNES, etc..) its a really great device and makes gaming on a tablet/mobile a blast. Inital setup is a bit of a pain but on the same level as adding any other keyboard or bluetooth device to your phone. The MOGA comes withaa dedicated app and 2 different bluetooth connection modes. A for MOGA specific tiles and B for normal bluetooth mode. If you’re only using emulators I would just stick to B mode and use the MOGA as a regular bluetooth controller. If I didn’t have a Moga Pro I would play zero games on any mobile Android device. 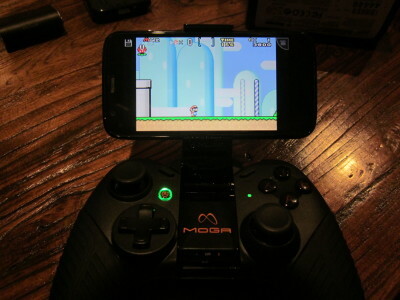 With the MOGA I now load up few different emulators and actauly enjoy gaming on a mobile or tablet. 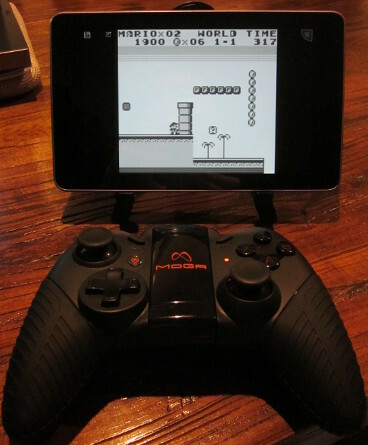 Forget the In-App Purchases based games that dominate the Android market, grab a MOGA controller for a retro-awesome gaming blast!